Lift your voice in song at our 72nd annual Community Carol Sing! Visitors from near and far return year after year to participate in this popular holiday carol sing, which is led by Associate Professor of Music and Director of Choral Studies at the University of Connecticut, Jamie Spillane, and backed by the Museum carolers and a brass quartet. 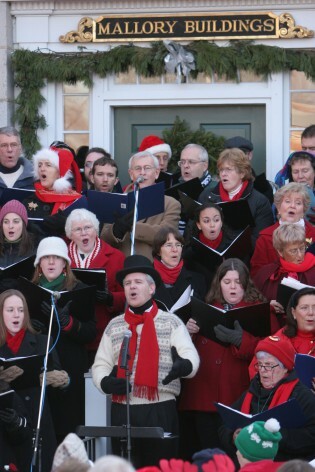 The Mystic Seaport Carolers will perform a holiday concert in the Greenmanville Church at 2 p.m. and the carol sing will commence at McGraw Quadrangle at 3 p.m. Explore exhibits and see the Museum’s 19th-century seafaring village decorated for the holidays. Climb aboard historic vessels and discover the winter sky under the Treworgy Planetarium dome. The planetarium’s program, “The Star of Bethlehem,” explores the winter skies, merging science, mythology, religious observance, winter traditions, and music.